This is an Anglicized form of the Old Gaelic name "O" hEachthighearna. The Gaelic prefix "O" indicates "male descendant of", plus the personal name Eachthighearna, a compound of the elements "each", a horse, plus "tighearna", lord or master. Hence, "lord of the horses". The Ahe(a)rns were originally a Dalcassin sept i.e., belonging to County Clare and Limerick. Their territory was in the neighbourhood of Sixmilebridge, County Clare. From here they migrated southwards to County Cork and Waterford and in Petty's census (1659) the name was widespread in these counties. 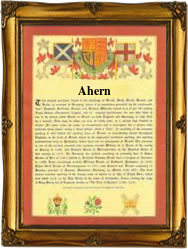 To-day, the name takes the form Hearn or Hearne in County Waterford. The family Coat of Arms has three silver herons on a green field. John Ahearne (circa 1769-1806) was a United Irishman who later became an officer in Napoleon's Irish Legion. The first recorded spelling of the family name is shown to be that of Alan O'Hathern alias O'Hachierane, which was dated 1336 - 1347, who was the Bishop of Kerry, during the reign of King Edward 111 of England, 1327 - 1377. Surnames became necessary when governments introduced personal taxation. In England this was known as Poll Tax. Throughout the centuries, surnames in every country have continued to "develop" often leading to astonishing variants of the original spelling.